Stonecroft Cottage is a traditional, 18th century Yorkshire Dales cottage, quietly situated in a cobbled lane, just off the Market Square in the Wensleydale town of Middleham, 5 minutes drive from the market town of Leyburn. Just a short walk from historic Middleham Castle, this cosy cottage has recently been refurbished to a high standard and offers bags of character, exposed beams, inglenook fireplace and wood burning stove. 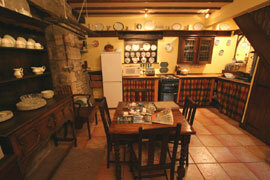 There is plenty to see and do from this Middleham Cottage. 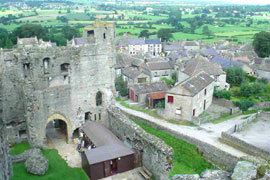 Outdoor enthusiasts will enjoy the numerous Dales walks, cycle routes and fishing. Visit the Dales towns of Hawes, with its Wensleydale Creamery, Richmond with its castle and Masham with its visitor brewery centres and icecream farm. Harrogate offers great shopping, the Turkish Baths and RHS Harlow Carr. Tour the natural beauty of Hardaw Force, Aysgarth Falls, Thorpe Perrow Arboretum and the stunning Northern Yorkshire Dales of Wensleydale, Swaledale, Arkengarthdale and Coverdale. Stonecroft Cottage Accommodation comprises: Lounge, with flatscreen Freesat TV and blueray DVD, pacious dining kitchen with auto washer and tumble dryer, two double-bedded bedrooms with Dales views, bathroom with shower over the bath. Prices include all electricity and solid fuel, and logs when available. Outside, to the front of the cottage, there is private parking and a south-facing patio. One well behaved dog is welcome.